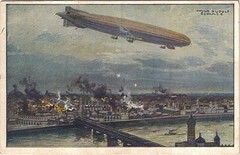 An old WWI propaganda postcard I bought recently which shows Schütte-Lanz Airship SL2 bombing Warsaw in 1914. The SL2 was 144 metres in length, but she was later extended to 156 meters, with a beam of 18 metres. She could carry a payload of 8 to 10 tonnes at about 88km/h (47 knots). “What’s an airship doing in a ShipWatcher blog” you may ask? Especially in a wartime setting. The Schütte-Lanz Airships were the precursors of the more well-known Zeppelins of the 1920’s and 30’s. The ship in this picture (and it IS a ship – even if it does fly) is about the same length as a small to medium sized cruise ship. In fact, later designs of the Schütte-Lanz Airship reached a length of 275 metres – about the same size as a modern ocean liner, although these later designs were never actually built. The most famous relative of these flying ships was the ill-fated Hindenburg. A Zeppelin measuring 245 metres in length, capable of carrying 70 passengers at speeds over 130km/h (70 knots). On one flight in 1936, the Hindenberg carried a specially designed aluminium grand piano – the first ever piano to be carried in flight. Airship technology is now over a century old. Who knows? Perhaps soon we’ll have modern safer airships conducting cruises similar to those of the 1930’s.